Combine all ingredients in a bowl until thoroughly mixed. I think it is easier to microwave the honey and nut butter for a few seconds first so that it is easier to stir. Then press mixture very firmly into the bottom of a 9×13 pan (like when make rice crispy treats). Place in freezer for approx. 1 hour, then slice into bars or squares with a sharp knife. If you prefer, you can also shape them into balls and place on a cookie sheet in the freezer for about an hour then store in a Tupperware container. Mix dry ingredients. Then mix oil, water, and vanilla in a separate bowl and then add to dry ingredients. Bake at 250 degrees for 45 minutes. Cool. 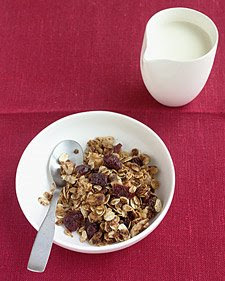 Can add raisins or dates if desired after cereal has cooled.